Thanks to the presence of cheese many marvelous foods are possible within minutes and to top it all my love for cheese makes it even more tempting to explore all the possibilities of creative recipes with cheese. Did I tell you that my little one is equally cheese crazy? Like mommy like daughter……hahahha……!!! 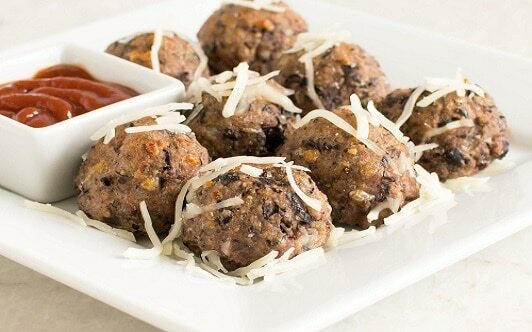 This cheese craziness brought an idea to my mind to add some protein and more health to the cheese bites recipe and so here I present my Cheesy Black Bean Bites. It’s super simple to make this recipe. Just combine mashed black beans, mozzarella cheese, cottage cheese, wheat flour, bread crumbs and season with salt, red pepper flakes, oregano and my favorite green chili sauce. Form balls out of the dough, spread on the prepared cookie sheet, moist the balls with egg wash (which is totally optional) and bake for 25 minutes in a preheated oven. See…. I told you its simple and delicious snack for your family and a great appetizer for any party. Preheat the oven at 400 degree Fahrenheit and prepare a cookie sheet with a liner and grease it. In a mixing bowl combine all the ingredients and mix very well with hands. Divide the dough into 20 equal parts and form a ball shape. Place the balls on the cookie sheet. Now in a bowl whip 1 egg and egg wash all the balls as shown above in the photo. Place the sheet in the middle rack of the oven. Bake it for 25 minutes. Take the cookie sheet out of the oven and let it cool a little. Serve warm or at room temperature with ketchup or your choice of sauce. You may also use milk and water (in equal proportions) to moist the balls instead of an egg if desired. Once out of the oven these balls would be soft leave it for coupe of minutes to cool down and stiffen. This recipe yields 20 bite size balls and serving size is 2 balls per person. These look awesome! I am always looking for meatless alternatives to make! This is a great meatless option – didn’t think you could make this with beans. These look yummy! I have been wanting to find more ways to add black beans to our menu. This would be a great way to add them. Thanks for sharing! I am seriously going to try these! Bookmarked this recipe for later use. Stopping over from your post in FBC. These cheesy bites look fantastic! My daughter will love them 🙂 Thanks for sharing it. These look delicious. I’m always searching for a way to prepare meals with black beans. We ALWAYS have black beans on hand!